Closed for almost a month now, one of Apayao’s major tourist destinations in Marag Valley is expected to reopen for tourists in August this year. Apayao Vice Governor Remy Albano confirmed this on Saturday, following a dialogue with concerned tourism stakeholders on Friday. “Thank God that our dialogue regarding the Dupag Rocks Formation was fruitful. We hope to formally open it again to the public on the first week of August,” said Albano. Last month, the Dupag Rocks Formation was temporarily closed to visitors, slowing down the arrival of local and foreign tourists in the area. The Apayao Tourism Office earlier reported there were some issues the Apayao government needed to address before hikers and trekkers could again be permitted to visit the area. The Apayao government assured it is doing its best to sustain eco-tourism in the area, and one of the major concerns is visitor safety. From Metro Manila, Marag Valley in Luna town is accessible by land via Florida Bus, one of the major transport service providers in northern Philippines. Travel time on public transport is approximately 13 hours. From Luna town proper, it will take about 30 minutes for visitors to reach the Dupag Rocks Formation. 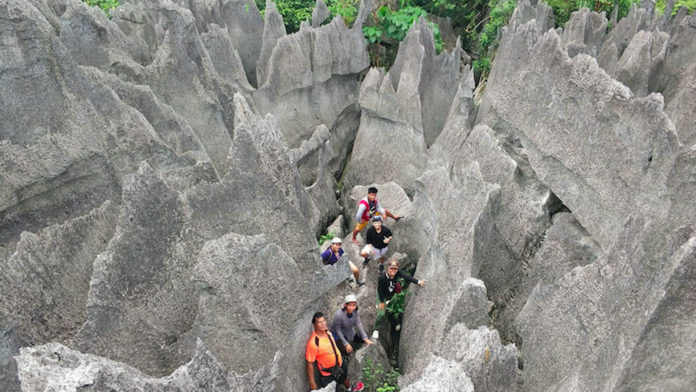 Before its closure, the sprawling labyrinth of 7 to 8-foot jagged limestone rocks that sits majestically atop a 30-meter high hill in Marag Valley had attracted hundreds of tourists daily.